We're here to help Canadians find comfortable living, from downsizing empty nesters as young as 40, to those in their 70's or 80's, and older, who are ready to move into one of today's exceptional seniors' care residences. Here's a look at all your options. Older couples and singlesez. People in their 50’s and older who have emptied the nest find active adult an ideal lifestyle choice. These purpose-built houses or apartments, sometimes in planned or gated communities, are not necessarily 55 plus only, but they are built with a suite of services and features that appeal to a peer group of people this age. Many include golf courses, art studios and similar hobbies. Aging people in these types of communities may hire off-site home care and other support. People may end up living here for several years or even decades, possibly moving onto a retirement home from here. Independent Older Adults. It's the most typical senior living model, ideal for those who want to live in a community of people their age with similar interests, and have all of their daily tasks taken care of. These residents are in good physical and cognitive health and need only some light assistance with tasks such as laundry, transportation and meals. Meals and housekeeping typically included with little to no healthcare. Off-site home care and support available for additional fees. See our Home Care section for services in your city. Seniors needing a little assistance. Ideal for residents of all ages with some limitations in physical/cognitive health, assisted living communities are designed for residents requiring on-site assistance with personal care, mobility, medication management and support. Daily support and personal care, meals and medication assistance included. Additional companionship care may come at an extra cost. Seniors requiring 24 hour care. Intended for seniors requiring access to 24-hour care and daily support services for physical and/or cognitive conditions, as deemed eligible by social service agencies. A wide range of care and different levels of service, including for Alzheimer's and dementia, make this an ideal community for a wide variety of people. All inclusive 24-hour care and support. Personal care, hygiene, and administration of any medicines. Routine doctor check ups may also be included. Additional companionship care may come at an extra cost. When extra care is needed at home or in a retirement community. Ideal for individuals who want to remain at home with assistance from a home care agency, including the chronically ill, or people recovering from illness or surgery. Agencies usually charge an hourly fee to provide a range of medical and non-medical services for personal care, homemaking, meal preparation, transportation and social support. Any type of home support (housekeeping, meal preparation), personal support (hygiene), companionship or medicine administrtion may be available at various costs. When families need to take a break from caregiving, several Canadian provinces support time off, or respite. Respite care is available through home care services and from retirement homes, as well as other healthcare services. Retirement homes offer a valuable alternative for families, given that they have a ready-made community of peers for the elderly, and they offer many healthcare services. Caregivers can take a break as short as 24 hours or up to 90 days annually, depending on what province you live in. Access to this service is often the result of a recommendation from government services. Round the clock medical supervision for those with dementia or other serious health concerns. Personal care for various ADLs. Administration of any medicines. Routine doctor check ups may also be included. This is ideal for those still recovering from surgeries (notably knee or hip surgery), who are done with hospitalization, but not quite ready to be independent. It's a unique service offered by some retirement homes and is also available through home care services. This service allows seniors to fully recover with the exact amount of healthcare needed. Retirement homes offer a clean, safe medical environment that may include an on-site doctor or nurses, as well as spa services and other amenities. It's an ideal way to fully recover. Round the clock attention is available, should an emergency arise. Personal care for various ADLs if needed. Administration of any medicines. Routine doctor check-ups may also be included. Spa services, physiotherapy and other options are available from some residences or providers. This type of care focuses on helping seniors who face serious illness that may be terminal. 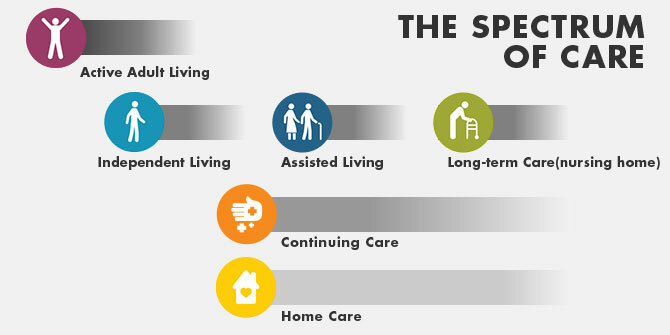 Home care service providers offer palliative and hospice care in the home. Many retirement residences offer this service to clients in their care who develop serious illness, while some accept new residents facing a terminal diagnosis. This service gives seniors professional healthcare attention in a comfortable environment, where they can keep contact with some peers. Professional healthcare is available from some retirement residences and many home care providers. Many retirement homes offer extra services and care like a spa, physiotherapy and other alternatives. 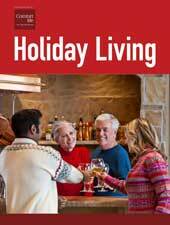 An apartment is an ideal solution for many seniors and senior couples. Find 1 bedroom and 2 bedroom solutions right for you in our look at senior apartments, including apartments in Toronto, Calgary and Vancouver. We look at condo living, an appealing option for many reasons. 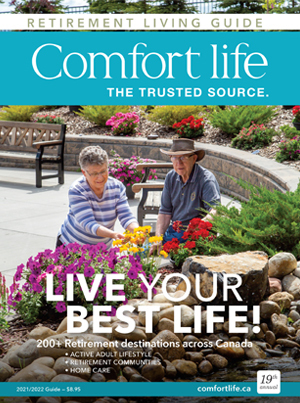 Find out more about retirement condos, including condos in Ontario and in Manitoba. We look at townhouses and townhomes appealing to those 55 and older. These are ideal for many senior couples and singles. Find listings and learn more about senior townhouses. Purchasing a unit outright allows you to build equity and benefit from increases in the real estate market. These communities offer a range of amenities for a fee, from housekeeping and snow removal, to personal support and health services. Take a look at retirement bungalows. An underappreciated option that combines the best of both renting and full ownership. You avoid the hassles of home-ownership – from security to taxes and maintenance – while also gaining any capital appreciation on the leased suite. This option is growing more popular. View leased and life lease communities. Compare ownership options: Buy, Rent or Lease?